What’s going on in Pauline-Cuisine? Last weekend, thanks to the sunny weather, I got up early on the morning and I took the opportunity to go to the London wholesale fish market. It was a long time without buying fresh fish. When I came back, the fish smell was really nice and I though that it will be great to do some nigiri and maki. 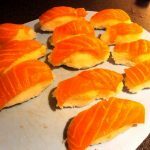 The first step was to slice the half salmon that I had bought then to slice thinly a salmon piece in order to do the top of salmon sushi. This part of the work is easy but you absolutely need to have a good knife for doing it. The hardest thing for me when I do sushi is to cook the rice. Indeed, the cooking way is important in order to have the right texture and make the sushi sharp. The easiest way to cook the rice is using a rice cooker but you can do it in a traditional way with pan and water. When the rice is ready, put some mirin in your hand for modelling the rice. I like the texture of the mirin and that helps to not burn the hand skin with the really hot rice. 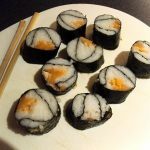 As I had some leftover from the salmon filet, I decided to make some salmon maki. My sister offered me a “easy suhi” for Christmas, it took me a long time to try it but now and I can confirm that is a brilliant accessory. You just have to pour it with all the ingredients that would like to add on your maki and then it makes the job. I wish you a nice weekend full of sun. See you next week with other amazing recipes.